← Colin Firth’s Paddington Bear…What Will He Sound Like? With the World Cup 2014 upon us England still does not have an “official” anthem after Football Association dropped their support for the Gary Barlow and Michael Owen version of Greatest Day by Take That. An online campaign has been underway to make late comedian Rik Mayall‘s forgotten Shakespeare-inspired song, “Noble England” Number 1 on the UK charts and to make it the official anthem for Team England. Team England needs an anthem and “Noble England” is a perfect fit! British DJ John Morter is behind the campaign to propel Mayall’s single to the top spot even creating a Facebook page specifically for fan support of the Drop Dead Fred star who died earlier this week at aged 56. Mayall cleverly uses re-worked lines from Shakespeare’s Henry V, dressed in period costume chanting ‘come on you England, you noble Englishmen’. What a perfect posthumous achievement it would be for Noble England to reach No. 1! Stay tuned and Once more unto the pitch dear friends! This entry was posted in Home Page Posts, Rule Britannia! 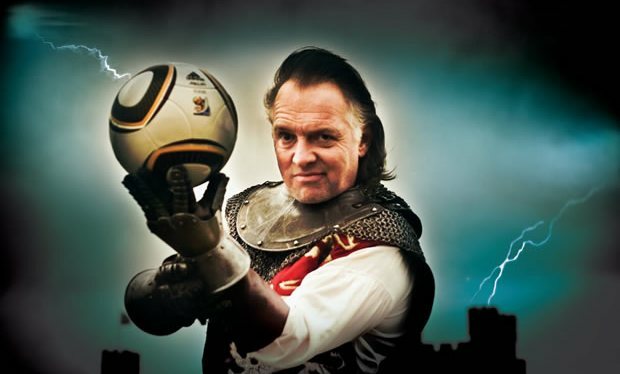 and tagged Rik Mayall, Rik Mayall World Cup Anthem, World Cup. Bookmark the permalink.